19 years into my career, I didn't want to simply count down years to retirement - I wanted to make a difference. Growing up overseas with parents who were missionaries, I had a unique introduction to education - and it wasn't good. At the British army base school where I attended kindergarten through third grade, I was ostracized by not only other students, but also the teachers who knew I was neither British nor army. I struggled in classes, and though I was later diagnosed with Dyslexia, the army base teachers didn't believe in "learning disabilities" back in the 60's - my parents were simply told I was a "strong-willed child, who needed to be broken." I learned to dread school; I would get physically sick simply trying to avoid the experience altogether, and it was largely because of how the teachers acted and treated me as a student. Thankfully, the summer between third and fourth grade, a gentleman who came to work in the area brought along his wife, who happened to be a retired reading resource teacher. She took me under her wing, using the summer to help me work through better learning strategies and catching me up on reading. She also diagnosed me with Dyslexia, helping to explain some of my school struggles. That positive interaction sparked the beginning of my interest and passion for education. As I continued on in school, I began to understand that school didn't have to be a scary and terrible place. I eventually realized that my lifelong dream was to become a teacher myself, and ensure that no student ever had the experience I had with school. For 19 years, I worked in the local traditional public school system. While I gained valuable experience, I felt that year after year we were getting farther away from giving every child that necessary attention to help them all succeed. As more and more testing was thrust onto us as teachers, I spent more time doing that than actually teaching - and what was more, I often didn't see the results. It was a measure for the school or state, and I was no better equipped to help my students. The frustration began to loom, and I feared I would become one of those "older teachers," counting down the years to retirement. When I heard someone was planning to open a montessori charter school in the area, I quickly sought out an open school board seat to at least get exposure at Lake Superior Academy. As I became more involved, I decided to make the jump to LSA purely out of trust in Susie and the montessori model. And while many of my fellow educators were skeptical that the move was a good one, my former principal wished me well, saying, "Sandy, this is how you've always taught in your classroom - it's just more YOU." 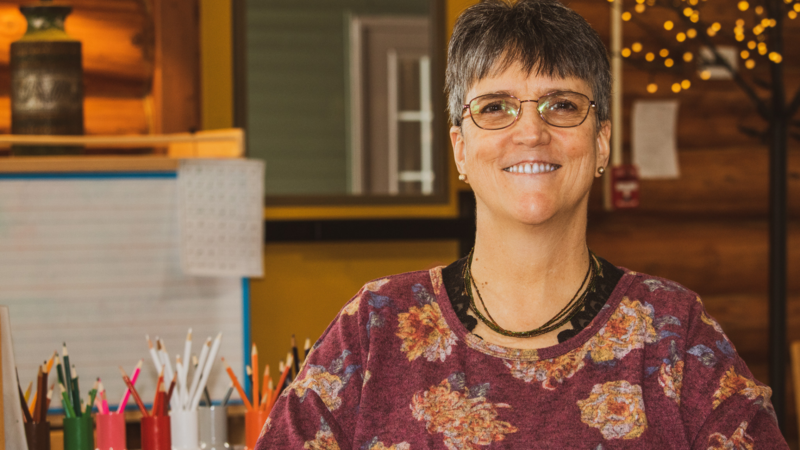 "You can tell just talking to Sandy that she was going to be a good fit at our school," said Susie Schlehuber, Head of School at Lake Superior Academy, "She just had that spark and passion to really make montessori work. Now having taught here for three years, the school just wouldn't be the same without her. She's built an incredible foundation and repor, not only with the students but also with the parents." I am so glad that I made this change - for the local students and for myself. A lot of the students we get at LSA come to us with behavioral and learning issues from the traditional public school system, and they are terrified of school. Through the montessori classroom style, we are able to set up our weeks completely different, and meet every student in the classroom where they're at with the various subject areas. I've noticed that these students who struggled in a traditional classroom were only exhibiting poor behaviors because they needed extra help in the areas they didn't understand. In my classroom now, I can work with those students one-on-one and help them flourish as learners. I never would have imagined twenty years ago that this is where my career would take me. But I am now in a school where I feel valued as a professional and education expert, by my students, fellow educators and parents. I love coming to work every day in an enviornment that is vibrant, exciting and is truly making a difference in my community. Thanks to my charter school, I am thriving. Find out why teachers across Michigan LOVE their charter school.